Partnering with the right branding agency, you can use typography to not only communicate your brand’s strengths, but also increase your brand’s memorability. Serifs, sans serifs, ascenders and descenders. Correctly selected typefaces will add additional personality to your brand. Serif fonts literally include serifs, the short lines and strokes that are often seen at the tops and bottoms of letters. Sans serif fonts, on the other hand, do not. In a serif font, the capital letter I includes two horizontal lines at the top and bottom of the I; in a sans serif font, the I appears as a single straight line. Both serif and sans serif fonts include ascenders and descenders. Ascenders are the lines that rise above the font’s primary height or x-height, as in the line that rises above the lowercase letter h. Descenders drop below the font’s base line, as in the lines that descend below the lowercase p, g, and q for example. How typefaces can convey meaning. Although the basic character form often looks the same, the letter’s serifs, ascenders, and descenders can be designed in many different ways. Each of these unique typeface designs helps convey a different tone or meaning. In the simplest from serif typefaces often appear more formal than sans serif typefaces, and the more strokes involved in the serifs, ascenders, and descenders, the more formal the font appears. This is in part because serif font strokes recall the days of formal typesetting and calligraphy. Sans serif fonts, on the other hand, often present a more modern image. 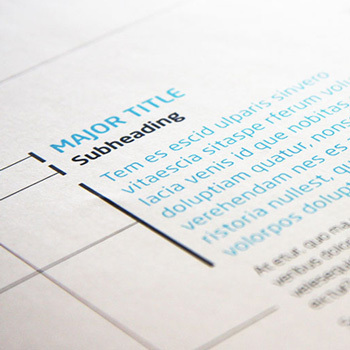 Many sans serif typefaces are designed to look sharp and clean. The majority of typefaces used in web design are sans serif, because the characters are more easily read at small sizes and at a low resolution. How the right typographic treatment can increase memorability of your brand. Working with a branding agency to create a typographic palette is an important component of your branding strategy, as it will in part insure an increased brand consistency to your marketing communications. How are the marketing messages in your communications presented? Are they printed in a typeface that is associated with your brand’s attributes? Have you considered developing an original typeface, to help draw visual attention to your brand? With the right branding agency, you can use typography to not only communicate your brand’s strengths, but to increase your brand’s memorability. That is the true power of typography, and why it has such a strong influence in brand design.